When I was growing up, I remember that my mother had one basic cookbook. That well worn book was like a kitchen Bible. Its cover bulged with recipes that Mother had clipped or torn out of newspapers and magazines and a few scraps of paper contained handwritten recipes for dishes she had made up or remembered from her childhood. During a multi-state move, when I was in high school, the book was lost. I did not realize how important that loss would be to me, until years later when I wanted to replicate my mother’s cheesecake, her light fruit cake, her unforgettable barbecue sauce and other amazing dishes and flavors. Mother did not remember the ingredients and I have failed to come close to what she had been able to accomplish. From time to time, I long for those flavors and I sometimes wonder where that book ended up and if someone still has those precious recipes. A word to the wise…if you find or create a good recipe that others will enjoy, be sure to share it with your friends and family…you may just need them to give it back to you someday! My daughter recently reminded me of a recipe that I had given to her many years ago. I forgotten all about it and I actually could not find the recipe when I searched for it in my extensive collection. Lucky for me, my daughter passed it on back to me and I was able to recreate Crab Pizza for a party my husband and I were attending that same night! 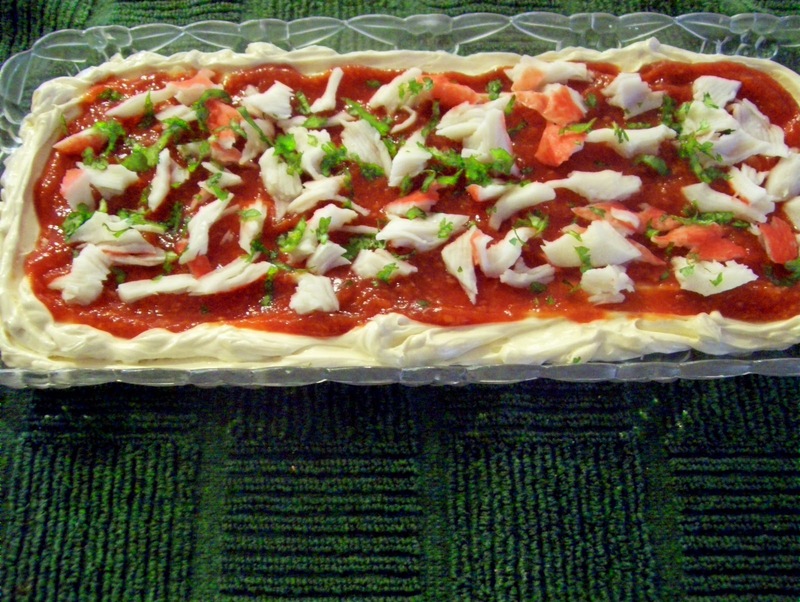 Crab pizza is an easy recipe to make, it is also tasty and very pretty. Party on! Beat together the first four ingredients until well blended. Spread on a plate or pizza tray and form a raised edge around the border. Carefully spread cocktail sauce on top of the cream cheese up to the edge. 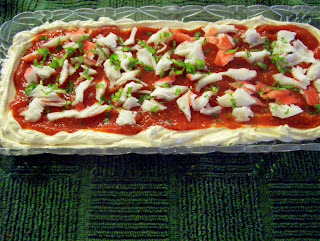 Scatter the shredded crab pieces attractively on top of the sauce and sprinkle with chopped parsley. Serve with wheat crackers. (Imitation crab was used in the pictured dish and recipe was halved). Cocktail sauce: Mix ketchup with desired amount of horseradish; blend well and refrigerate until needed.